The Mantis is one of the Creatures in ARK: Survival Evolved. It was added in the Scorched Earth DLC on September 1, 2016, and included with the Ragnarok expansion on June 12, 2017. The existence of a creature such as Empusa discipulus is both fascinating and frightening. Not only is Empusa the only recorded insect to have developed an opposable digit, allowing it to grip objects and use tools, but it possesses a level of intelligence that is unrivalled among non-human species. I have even found clear patterns in the sounds Empusa makes when communicating with its own kind, as though it is actually using some kind of dialect. Highly aggressive, it attacks any medium-size or smaller creature that enters its range. It looks just like an average Mantis but much larger and deadlier. It usually comes from a light green to a brown or a yellowish color. This section displays the Mantis's natural colors and regions. For demonstration, the regions below are colored red over an albino Mantis. The colored squares shown underneath each region's description are the colors that the Mantis will randomly spawn with to provide an overall range of its natural color scheme. Hover your cursor over a color to display its name and ID. 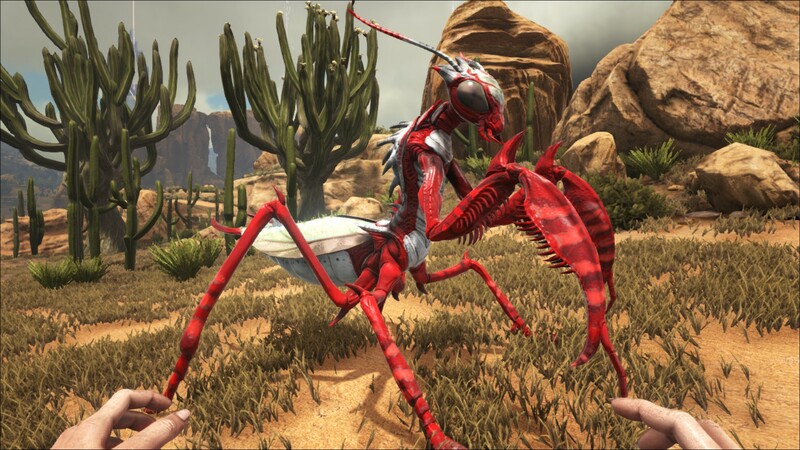 For example, "cheat SetTargetDinoColor 0 6" would color the Mantis's "body" magenta. Mantis spawn in packs of around 2-3 individuals within caves and desert dunes. Due to their pounce attack they have a fairly large aggression range. Once one Mantis spots prey, the others usually follow. They will attempt to rapidly close the distance with an initial pounce before delivering an onslaught of rapid slashing attacks. Avoid close combat unless you have a strong enough mount, or good gear. Due to the fact they spawn in packs they may often be mate-boosted, increasing the power of their fast and deadly attacks. If you don't have faith or think you can't stand a close-up fight, range attacks with fire arrows or other powerful projectiles should do the trick easily. One might consider using a Bow or a Boomerang to keep the mantises at bay and possibly knock it out for running away, or even building a trap around it to tame later. A Rock Elemental would be a great bodyguard in case there are too many to fight. BEWARE of Pounce at Mid Range: with Mantis often spawning in groups of 2-3, taking three hits of this powerful attack can deal tremendous damage. Mantis are powerful melee attackers when wild, avoid close-quarters combat unless with good gear or a sufficient mount. Its main weakness is bug repellant because it will enable you to attack the Mantis without being noticed if you're careful. Fire Arrows from a crossbow deal massive damage sometimes killing high levels (100+) with a single arrow from a primitive crossbow. However it is not an instant kill. It will take a few seconds but when attacking from a range there is very little to fear when using fire arrows. The Mantis is unable to be tamed through the standard tranquilize-and-feed methods, and must be tamed non-violently. To feed it, place a Deathworm Horn in the last slot of your hotbar, then when approached press "use" (default e) to feed it. You cannot feed them all the horns required for taming at one time, you must wait a few minutes after each feeding to give it the next one, and repeat until the taming meter is filled. The Mantis is normally aggressive, so Bug Repellant is needed in order to get close enough to feed it. A set of Ghillie Armor is also useful, but not required. The Mantis becomes aggressive if you are too close. The taming progress will become halted until it loses interest in whatever it was fighting, or even decrease if it's aggressive for too long. A good trap to tame the Mantis is a single foundation (Stone, Adobe, or Metal) with 4 walls on the first level, and 3 walls on the second level. Lastly add two ramps to the last opening on the second level. Part of the Mantis will stick outside of the trap and you can feed it. You will not need any Bug Repellant or Ghillie Armor with this method. Note: On the Ragnarok map, you can get the horns from the Deathworms in the desert or from the Iceworm Males in the Frozen Dungeon, where they provide a plentiful supply. However, given the high level of this dungeon, it might be safer to go to the desert. 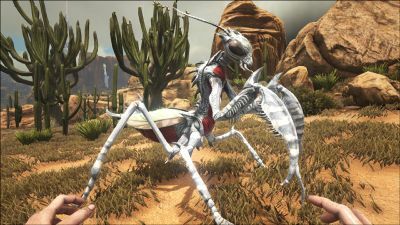 Mantis eat every 3 minutes regardless of level, ignore these feeding intervals, this means that a lvl 150 Mantis only takes 45 minutes to get tamed, official server tested. 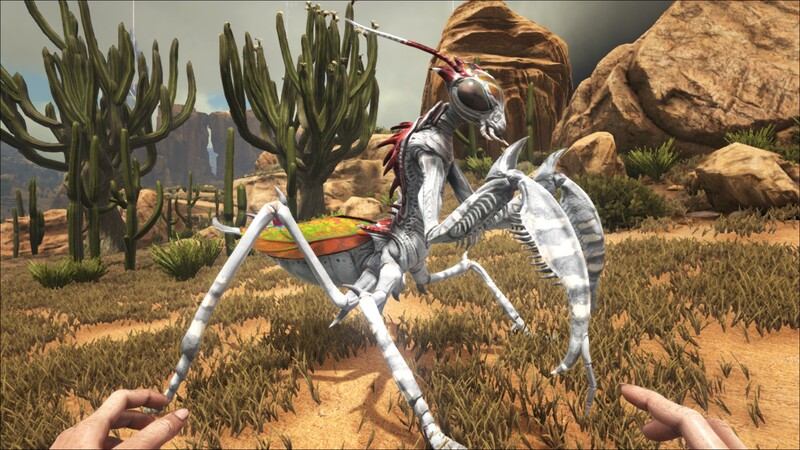 The Mantis can equip a pick or hatchet, or even a sickle, allowing it to gather resources using these tools rather effectively when one does not have specialized mounts for such. Due to its ability to equip tools the Mantis can be used as a mobile light source by equipping it with a torch. The ability for the Mantis to wield melee weapons, including the sword, allows it to be a fearsome combatant, but this also allows them to change up their tactics entirely by using a club, inflicting torpor damage against opponents as needed. Better weapons from better blueprints can massively increase the effectiveness of the mount's attacks, making this one of the only mounts where the quality of items other than the saddle is of great consequence. 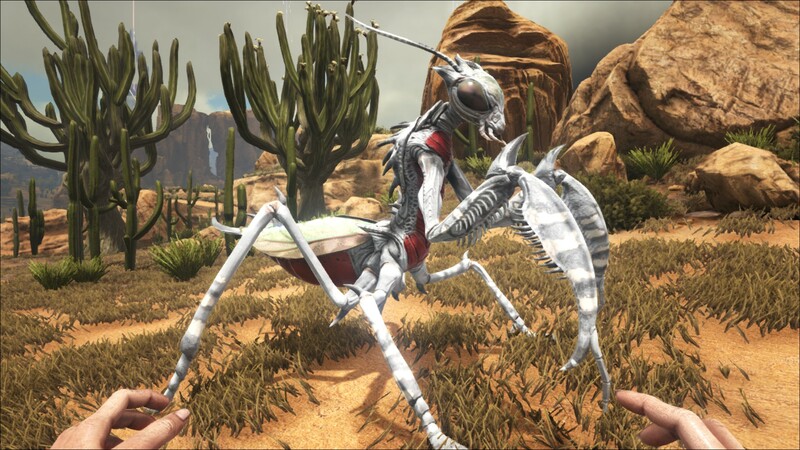 Using simply primitive clubs, a high-level Mantis with average melee damage can knock out a mid-level scorpion (or even another Mantis) with a pounce and a few standard bash attacks. With higher end clubs and higher melee, the increased torpor could allow for Mantis to be used on more difficult tames. Since it is able to equip tools, the Mantis can also equip mining tools like a Pick or Hatchet. Resource gathering rate is directly linked to the tool the Mantis is carrying. As equipping a tool with a Mantis has it wield two of the tool, the normal rate of the tool is multiplied by 2. When you leap with a tamed Mantis then move far enough away to unload the Mantis, it will constantly generate a wind effect that is triggered from leaping; the audio will endlessly loop until you make the Mantis leap again, which will stop the looping sound effect. This doesn’t fix it permanently, however, as it reoccurs every time the mantis gets unloaded and loaded again. The only way to fix this is to log out and rejoin. This only happens in single player. You need to be at least level 40 to feed a Mantis. According to the Mysterious Mystery Dossier, it's very intelligent, with four tick-marks for intelligence. The only other creature with four ticks is Troodon. Also similar to Troodon, the taming icon has a tick and an x, implying that it must be tamed in a unique way, as Troodon and Titanosaur are. It's confirmed that the creature's alternate attack has increased harvesting capabilities. It also has a picture of the Crafting icon with two ticks, meaning that it can hold tools in its hands. The dossier states that the Mantis may have their own language. Although this may seem far-fetched, many animals seem to have their own system of "language". Prairie Dogs have distinctly different warning calls for different predators; and Orcas from different parts of the world seem to have different "dialects", even "accents" in their calls and songs. There is a giant praying mantis Triassic of order "Titanoptera" (the most well-known member being the Gigatitan). However, this insect is much smaller than the Mantis in ARK. Dahkeya, in one of his explorer notes, reports that a group of Mantis destroyed a water pipe outside of town; knowing it would draw humans to come out to fix it, so the Mantis could hunt and feed. This shows extreme intelligence on the behalf of Ark's Mantis that perhaps even the Troodon doesn't have.